↑ Staff (सितंबर 7, 2014). "Revisiting the Moon". New York Times. पहुँचतिथी सितंबर 8, 2014. ↑ 2.0 2.1 Phil Plait. "Kryptonite for the supermoon". Bad Astronomy. Discover. पहुँचतिथी अगस्त 29, 2015. ↑ Rachel Rice. "No Link Between 'Super Moon and Earthquakes". Discovery News. पहुँचतिथी मार्च 20, 2015. ↑ "'Supermoon' coincides with lunar eclipse". BBC News. 28 September 2015. पहुँचतिथी 29 September 2015. ↑ Meeus, Jean (1997). Mathematical Astronomy Morsels. Richmond, Virginia: Willmann-Bell. प. 15. ISBN 0-943396-51-4. ↑ Plait, Phil (मार्च 11, 2011). "No, the 'supermoon' didn't cause the Japanese earthquake". Discover Magazine. पहुँचतिथी 14 मार्च 2011. ↑ Hawley, John. "Appearance of the Moon Size". Ask a Scientist (No publication date). Newton. पहुँचतिथी 14 मार्च 2011. ↑ Phillips, Tony, Dr. (मार्च 16, 2011). "Super Full Moon". Science@NASA Headline News. NASA. ओरिजनल से मई 7, 2012 के पुरालेखित. पहुँचतिथी 22 June 2013. ↑ Nolle, Richard. "Supermoon". Astropro (No publication date; modified मार्च 10, 2011). पहुँचतिथी 14 मार्च 2011. ↑ Phillips, Tony (मई 2, 2012). "Perigee "Super Moon" On May 5–6". NASA Science News. NASA. पहुँचतिथी 6 मई 2012. ↑ Plait, Phil (2008). "Tides, the Earth, the Moon, and why our days are getting longer". Bad Astronomy (Modified मार्च 5, 2011). पहुँचतिथी 14 मार्च 2011. ↑ Sumich, J.L. (1996). "Animation of spring and neap tides". NOAA's National Ocean Service. पहुँचतिथी जून 22, 2013. ↑ "Apogee and Perigee of the Moon". Moon Connection (No publication date). पहुँचतिथी 14 मार्च 2011. ↑ Rice, Tony (4 मई 2012). "Super moon looms Saturday". WRAL-TV. पहुँचतिथी 5 मई 2012. ↑ Andy Bloxham (मार्च 21, 2011). "Supermoon blamed for stranding five ships in Solent". Telegraph.co.uk. पहुँचतिथी जून 22, 2013. ↑ Paquette, Mark (मार्च 1, 2011). "Extreme Super (Full) Moon to Cause Chaos?". Astronomy Weather Blog. AccuWeather. पहुँचतिथी 14 मार्च 2011. 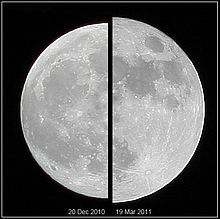 ↑ "Is the Japanese earthquake the latest natural disaster to have been caused by a supermoon?". The Daily Mail. मार्च 11, 2011. पहुँचतिथी 14 मार्च 2011. ↑ "Can the position of the Moon affect seismicity?". The Berkeley Seismological Laboratory. 1999. पहुँचतिथी 14 मार्च 2011. ↑ Fuis, Gary. "Can the position of the moon or the planets affect seismicity?" (No publication date). U.S. Geological Survey: Earthquake Hazards Program. पहुँचतिथी 14 मार्च 2011. ↑ Wolchover, Natalie (मार्च 9, 2011). "Will the मार्च 19 "SuperMoon" Trigger Natural Disasters?". Life's Little Mysteries. पहुँचतिथी 15 मार्च 2011.